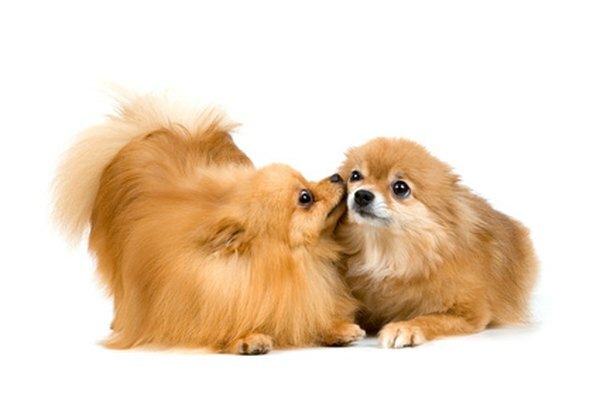 Keep your Pommie looking his best with regular baths and grooming. The Pomeranian's coat is his crowning glory. Fluffy, soft and shining, it's like a lion's mane, although admittedly a full-body mane. Regular grooming is a must and while a professional groomer should take care of cutting your dog's hair, you can bathe him yourself at home. Attach the sprayer hose to the faucet on your sink if you don't have one installed. Turn on the water and adjust the hot and cold so that it is comfortably warm. Test the water with the inside of your wrist. Place your Pomeranian in the sink, positioning him so that the sprayer is directed away from his face. Lift your dog's face and gently spray him, wetting his entire body starting at his head and working toward his tail. Spray his chest and belly, then his back and tail. Continue spraying him until his coat is thoroughly saturated. Pour a dime-sized drop of shampoo into your hand and work it around with a bit of water to start the lather. Rub the shampoo onto your dog, starting with his back, then working the lather onto his sides. Use more shampoo if needed. Tip your Pommie's head up and work the lather on the top of his head, on his neck and chest, down his front legs and under his belly. Work the lather on and between his back legs and finally onto his tail. Work the lather in the direction of the fur to discourage tangles. Spray your dog to thoroughly rinse him. Gently spray all over his body, starting with his head and working back to his tail as you did when first wetting him. Rinse until all the shampoo has been removed and the water runs clear. Pour a dime-sized drop of conditioner into your palm and rub it around before applying it to your dog. As with the shampoo, start with his back and sides and move to his head and neck, then chest, belly, legs and tail. Use more conditioner as needed and remember to work the conditioner in the direction of the fur. Leave the conditioner on your dog for the amount of time the packaging recommends. Spray your Pommie thoroughly to rinse him. Lift his head and gently spray his head and neck, then work backward to his tail as you did when rinsing the shampoo. Spray with one hand while using the other to work the conditioner out of your dog's coat. Rinse until the conditioner has been thoroughly removed. Wrap a towel around your dog (leave his head uncovered) and remove him from the sink. Blot his fur with the towel, but don't rub, as that can encourage matting and tangles. Carefully dry around his face and ears and gently squeeze the water from his fur in sections. Dry your Pomeranian thoroughly with a dog dryer or a regular hair dryer set to low or no heat. Take care around the head and face, aiming the air flow against the direction of the fur. Start at the tail and back and move forward, making sure to dry your dog's underside and legs, too, brushing your Pom's coat with the dog brush as you dry. Bathe your Pommie at least once a month or as needed. Take care not to get water in your dog's ears when shampooing and rinsing his head. This can cause discomfort or lead to infection. Opinions differ from groomer to groomer on whether or not you should brush your Pomeranian before you bathe him. Brushing does remove loose hair, though, which can be helpful during and after the bath. Using your shampoo on your Pomeranian will dry out his hair and skin. Your Pommie's pH level is higher than yours, so he needs a specialized shampoo that is made with his needs in mind. Always blow your Pomeranian dry so that he doesn't catch a chill, which is a concern even in warm weather. Also be sure to dry him thoroughly, as any dampness left on his fur and skin can cause skin problems. How Long Should You Wait to Bathe a Dog After Neutering? How Do Professional Groomers Bathe Cats?